Terry, Montana is a small town, but one of significance in history, as it was right along the railway as it first came through Montana. It isn't as big as it once was, but it's made a real name for itself with a remarkable amount of culture and even a fantastic smattering of eateries. One such place to dine is The Dizzy Diner. The Dizzy Diner is Family owned and operated by Rance and Pam Jonas and Family since 2001. The Diner has been around for a long time. It was built in 1960. We have continued the homecooked theme, you will find homemade daily soups as well as a pie case with homecooked pies, cookies and donuts. Breakfast is served all day Monday through Thursday from 8:00am to 4:00pm, Friday and Saturday 8:00am to 8:00pm. On Sunday Breakfast is served from 8:00am to 11:00am, followed by a homecooked Sunday Dinner. Sunday dinner is a three course meal (full salad bar, main course, dessert and coffee or tea. You will find us open year round. Our menu includes the old standbys; burgers, fries and gems as well as Healthy build your own Wraps, Our Famous Reuben, and various sandwiches, all come with your choice of sides. Stop in, I know you will be glad you did! Just off I-90 onto Highway 253, 2 blocks north. 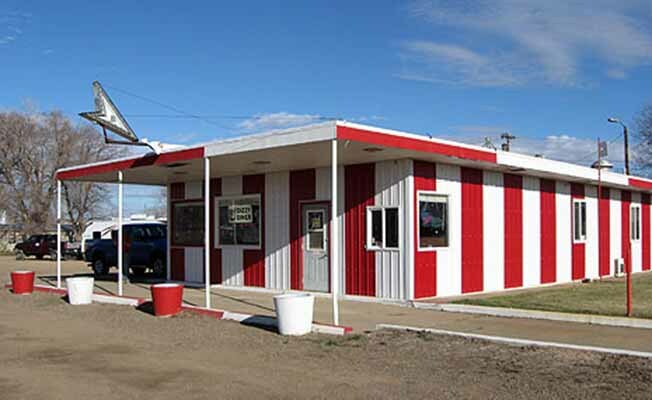 See our friendly red and white triped diner from the overpass.Just off I-90 onto Highway 253, 2 blocks north. See our friendly red and white triped diner from the overpass.